"The shed is so nice, we hate to call it a shed! So, it has become our "garden cottage"! Everyone was terrific to work with!" I just wanted to thank you again. 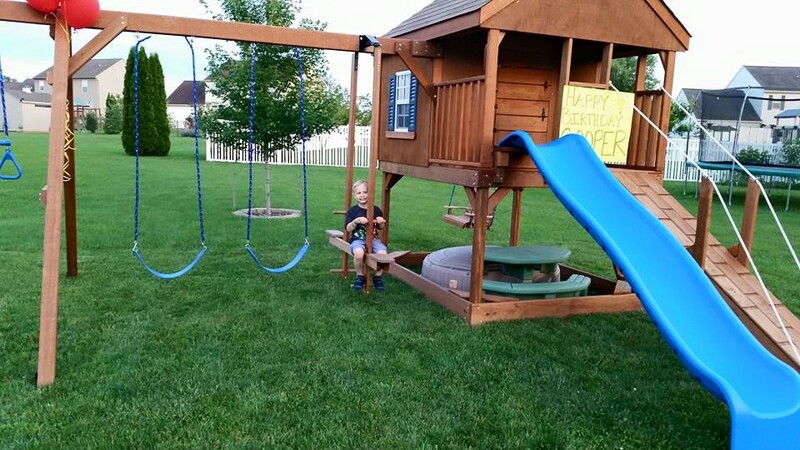 We are very pleased with our swing set... my little boy had such a great time last night playing. While your staff was installing the set they were very kind, courteous & answered all my questions. Please pass along to them that I appreciated their customer service. I commend Fox Sheds for their attention to their customer and the respect and courtesy they provide. This was a big purchase for us personally and we did look around at other places but Fox Sheds by far had the best customer service and was kind and easy to work with. I will definitely pass along your name to anyone that is looking for products that you carry because I know they wouldn't be disappointed. "We are so happy with our shed. Everything we expected from beginning to end, sales, site prep & delivery, just great. Ed put Linoleum on the floor and I made curtains, looks great." "We Couldn't Be Any Happier!!!" "Adam helped me design the perfect shed for my needs. I am extremely satisfied with the knowledge, help, design, fabrication & delivery of my shed. The delivery person was also great making sure to place the shed exactly where I wanted it & made sure everything was level and in proper working condition." Purchased Shed On-Line, Very Happy with it and with the professionalism of Lamar, who delivered the shed. "Both Tony and I are extremely pleased about the shed we received. It is of great quality & design. The whole process was wonderful from the initial design meeting through and including the delivery. We are very happy! Great job, Adam and Jeannie." "We were very pleased with the entire transaction. Adam worked with us in doing the site prep - gave great advice and arranged to have the site prep and delivery in one day. 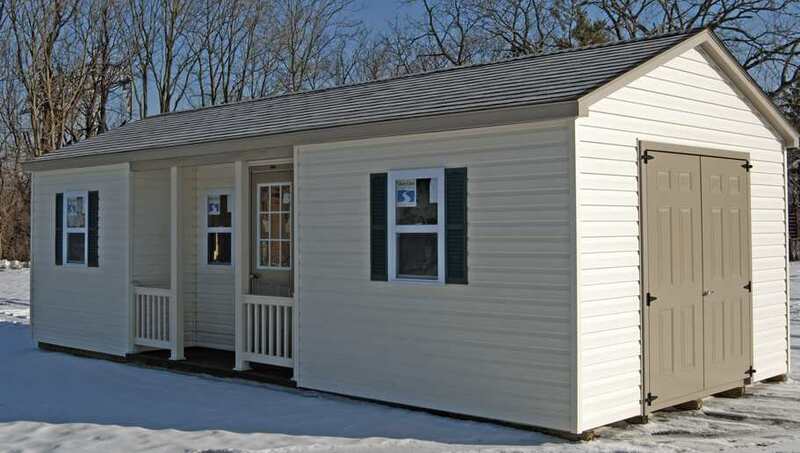 Our shed is well made and more than meets our expectations." 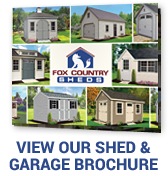 "Fox's Country Sheds is a company that cares about its customers. Very prompt and reliable. A rare find these days". "I purchased a shed from Fox's because they designed and built exactly what I wanted. Also, they were able to easily make what I thought was a difficult delivery." "Great shed! Thanks for making this a great experience." "We were extremely happy with the entire process. Adam was extremely knowledgeable. Our shed was a custom unit, and he was instrumental in planning the design. He was also very prompt in getting back to us with answers to our questions." "It was a pleasure dealing with Fox's for my shed purchase from start to finish. The whole process was easy and any concerns I had were addressed immediately. The quality of the shed is great too. Thanks a lot!" "Adam was very consultive, sincere and helpful in determining our shed purchase decision. We are also grateful for his site prep consultation and recommendation. The site prep work and shed delivery occurred as promised. I've highly recommended Fox Sheds." "Great shed - great lighting, well constructed! My biggest problem is keeping my daughters from having friends over to play (and sleep overnight) in my new garden shed!" "Every person with whom I have had contact was pleasant, knowledgeable, polite and helpful. The day the old shed left, the site was prepped and the new shed arrived - all went well! One always should expect good service, but unfortunately it often doesn't happen. Thank you for being the exception to the rule." "I bought my first shed there about 25 years ago (known then as Brickerville Structures). My experience buying a shed at Fox Country Sheds was wonderful. From all the help from Jeannie and Adam, including the wonderful team for site prep, delivery and excellent construction, I was thrilled with the "family" type care and concern they all showed. The shed is beautiful and an asset to my property. Thank you so much! All your workers are so caring and special." Thank you so much for all the time spent with us in coming up with a design for our playset. You never gave up & you were always so positive about it. Thank you for your exceptional service & for your crew of hard workers. They did a great job. Thanks! Very happy with the shed. Good job. The delivery person was very good and professional. I would recommend your company in the future. Great service, and a great shed. They built exactly what I wanted at Fox Country Sheds. We got a great price for a shed, and great service too. It was free delivery to our house, and they set it up right in our back yard. I was able to match my siding so it goes with my house. We''ll be getting a swingset from them soon, too. I stopped in at Fox Sheds to see theie inventory and operation. I was impressed by the quality of construction. I was even more impressed when he told me they made everything on site! I've been in construction and manufacturing. Adam Kuntis does a great job with both. I can highly recommend his sheds, playsets and other products. Our shed was built exactly the way we wanted it, for a very reasonable price. I thought delivery would be difficult because of some trees and our pool, but they made it very easy and it was impressive. We selected all of our colors and even the style on their website. They were very helpful and easy to work with. I highly recommend Fox's Country Sheds. We are now in the process of buying a playset from them also. Excellent personalized service; attention to detail and quality products! Your company did a great job building our shed. It looks great and is exactly what we wanted. The double wide garage looks great and we are very pleased. I cannot wait to waterseal the floor and get the electrician in to hook up some lights and outlets. Each and every one of your crew did an excellent job at their own tasks and got the garage put together much quicker than I would have though possible. They were very polite and knowledgeable in answering my many questions, and I am confident the garage will serve us well for years to come. All of my neighbors keep coming over to tell us how good it looks. Thanks to all of you for all of your hard work. It was a pleasure. Just wanted to say how we like our new shed and how nice everyone was today! we were impressed with the way every thing was handled. We want to thank Lamar, Shawn & Brian. They all were so nice and explained every step. We will defiantly recommend Fox's sheds. Adam...the garage is fantastic! Lamar did a great job getting it into place. It matches the house perfectly and looks like it was built with it...siding...doors...everything. Thank you so much for your great customer service and quality product. Adam, Thank you and the Fox Country Sheds team, for outstanding workmanship and customer service. What a great shed! I will recommend your services to everyone. Adam, Thank you so much the the new shed set in place yesterday. The quality and workmanship is far beyond what I expected. It is beautiful and exactly what my wife and I wanted. You have been very pleasant to do business with and professional. I appreciate the expediting that allowed the shed to finish ahead of schedule. Lamar delivered it exactly on time and he also was a fine representative of your company. Fox's Sheds will only get positive reviews from us and will try to encourage others to purchase from you. Thank you soooo much. I love the shed and it looks fabulous. All went smoothly. I would recommend you in the future! Adam, I wanted to say thank you for the excellent service you provided. I am so excited to have my shed. I will definitely let everyone i know & deal with about Fox Country Sheds. Thank you..
"I wanted to take a minute to let you know how very pleased Andrea and I are with the shed. I was really surprised at how tall it was and all the room on the loft. I'm going to build one on the other side since the clearance is so high it will definitely be out of the way. The structure is really beautiful and obviously well built considering what Dale and I had to do to get it in place. The Easy Mover was worth every penny. Dale was very knowledgeable and extremely helpful getting the shed exactly where I wanted it and then leveling it. It looks fantastic in the yard. It was a real pleasure dealing with you and in the event we have more work in the future, or our friends do, you are at the top of the list." I wanted to let you and your team at Fox Sheds know that we love our five sided (Corner Nook) shed! It looks great, colors are perfect, the quality of the construction is well beyond any other sheds we have seen, and the configuration has allowed us to get things off the floor and on the walls for more efficient storage. Also, Dale did a great job navigating the shed through the tight fit to get the shed in place. It's been a pleasure working with you and thank you for everything! I wanted to take a moment to personally Thank You for all your assistance. You were extremely knowledgeable and honest. As for the final outcome, the building is perfect. We love it and thought that the guys did an amazing job. They were very professional, respectful and swift. I especially appreciated that they cleaned up everything and left no garbage. My neighbors are still talking about how quickly the building went up and how great it looks. Please thank them again for us. I was hoping you would be able to pass on this Thank You note to the two men who installed the playset that we purchased. 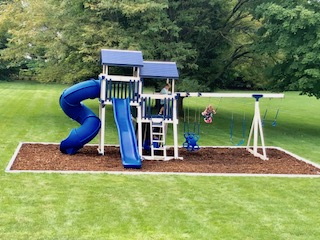 They were both very courteous and friendly and did an excellent job: "We just wanted to thank you both for doing such a great job setting up our play set. 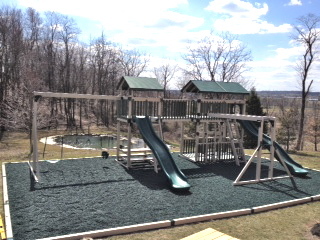 The kids love it and want to go out in the yard to play on it all the time, even with the bad weather." Everything went well and Dale (Driver) did a great job. The shed looks great and I appreciate you getting everything done so quickly. It couldn't have been better timing with the weather. "The shed delivery went smoothly. The driver was very skilled at placing the shed into a tight spot. The shed itself is well constructed and looks great. Thank you for your assistance." "The shed looks great, this whole process has been so smooth. It's good to know that there are still places that delivery what they promise." 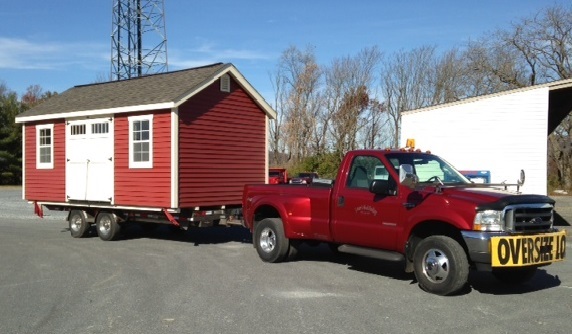 "Adam, received the shed last week and wanted to thank you for the great experience. Your website was great in placing the order and ability to make engagements and see what each option looks like. In addition, your customer service in quick responses over the phone and email is outstanding! Your delivery service did a great job getting in its place, and was quick to resolve an issue that was presented. My entire purchase was great and should I have a need for your products or can refer someone looking, I will certainly contact you first." "We are extremely satisfied with the service we received from Fox Sheds. Everyone we met at Fox Sheds, including the installation team, was kinds, courteous and very professional. We would highly recommend Fox Sheds to anyone looking for a playset or other service". 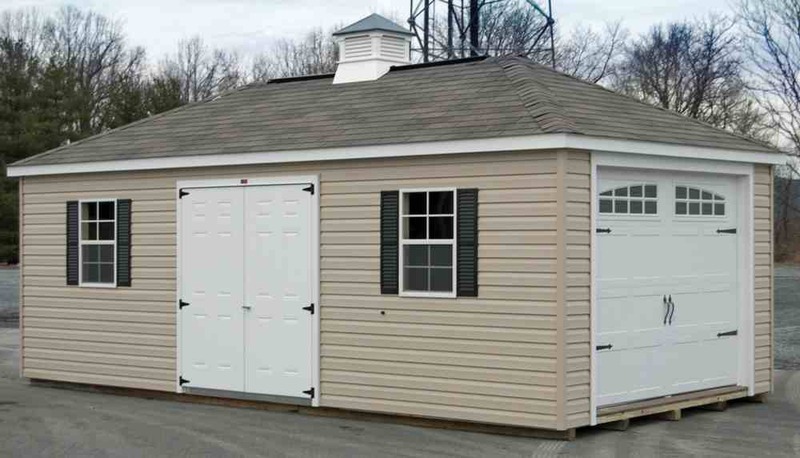 "Great salesmanship and knowledge of the sheds. I couldn't be happier with my new custom Heritage shed. Great delivery guy that really worked with me for a good delivery time". Sam arrived today about 8:45 and left about 10:00. He was amazing in his handling of the trailer and setting the shed down. He set it in between two trees with about 6" on either side. Had to come under a power line and a tree branch, too. I can't say enough good things about Samuel. Really nice guy and great at what he does. I really like the shed. It is beautiful and very well made. Two of my neighbors have come over and said how nice it looks. I am quite satisfied with it and thankful that you got it here so quickly. Thank you very much for your service. I was nervous trusting a company online and never seeing the product in person. But it was the reviews that made me roll the dice - glad I did. shed looks awesome. Adam, just wanted to let you know that I am very pleased with the double wide garage that was fabricated for me. The workmanship and finish is very good. The two young men that did the delivery and set were very professional and did an excellent job. Thanks for an overall excellent transaction with no hidden costs or fabrication issues, everything went as you described when my order was placed. If you should need a reference do not hesitate to use my name. Thanks Adam. The shed is AWESOME! "Thanks for everything! The shed looks fantastic and I'm excited to start parking in the garage! Have a great week!" "Thank you Adam - the garage is awesome! I really like it, good job you guys did. I would highly recommend you guys to anybody." "Thanks again for all of your help and for the excellent service that we received! From ordering, to paying, to delivery and installation, we were impressed beyond belief!" "We just wanted to write a quick note to say thank you. 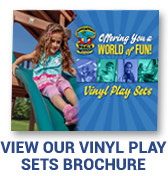 We are so glad we chose your company to help us with our shed and playset. We are over-the-top excited with how everything turned out. The kids LOVE the playset and the shed is perfect for what we needed. Even when we called with questions or concerns you ALL were so quick to help...and the guys doing deliveries were SO nice to work with. It was such a pleasure doing business with your company. Thanks again." The Gazebo is lovely. The workmanship is excellent and the delivery was flawless. We enjoyed this season's first batch of steamed crabs in there Sunday. It will be the perfect setting for the wedding. It has been a pleasure doing business with you. I wanted to take a moment just to say thanks to you and your crew for the great job you did on assembling and delivering our new shed. Everything went as planned. It was fun for us to watch Marlin do his magic in delivering and unloading the shed yesterday afternoon! Also, so glad that you were able to get the delivery done before our vacation. I don't know if you pushed us up in your schedule or not, but this was perfect timing for us, as I will be out of town for two weeks starting tomorrow. If you ever need a reference in the Berks County / Birdsboro area, please let us know. We would certainly give you an enthusiastic, positive reference. All went very well yesterday with our shed delivery. You run a very efficient company and Jeff's delivery is a great compliment to your organization. We are thrilled with our playhouse (Happy Hideout). The grandchild loves to play in it, and our five great grandchildren will get to use it for many years. It is so well built! We appreciated the prices being on the website. Excellent experience working with you. Enjoyed the friendliness of your employees. Our shed was delivered today at the exact time that Jeff said he would arrive. Quality of construction looks really good and mule delivery was easy for Jeff as there were no obstacles in his way. Beige color was more yellow than we thought but it looks ok. Thank you for your quality product and professional assistance. The shed is very nice. I also wanted to tell you how nice Jeff was to work with getting the shed in place� he sure has the personality for working with people. I received several quotes, both locally as well as online. Not only was the Fox Shed's sales department responsive, they were professional. The team was ready to answer all of my questions promptly and I found them very knowledgeable and extremely helpful while I prepared the site. J. Adams, Orange County, NY. Your superbly built shed is the capstone to our backyard pool project, and your customer service is second-to-none. Fox Sheds was the only company that inspired confidence with our custom creation, and your company exceeded all expectations from design support to craftsmanship to installation. Working with you and your team was the only seamless part of our pool project; you delivered exactly what you promised. Thanks so much. The kids love it!! Thanks for your help! Shed delivered and looks great. Jeff was a master at driving that mule. Thank you guys do much! !